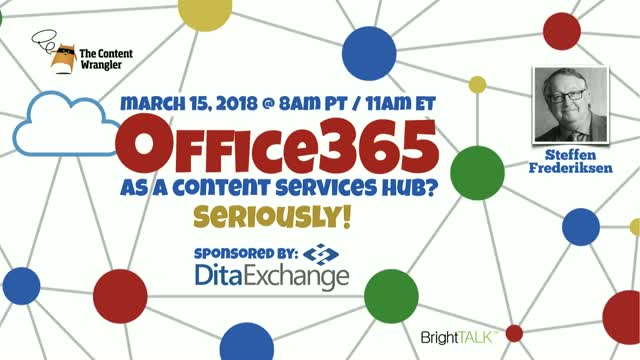 Office 365 As A Content Services Hub? Seriously! Do you have Office 365 in your organization? You may not realize it, but you already have the perfect solution for delivering the right information to the right people, at the right time, in the right format and language–and on the device of their choosing. Most content services hubs are expensive and complicated. Office 365 is an affordable, cloud-based, scalable platform that allows you to build content for a future of AI, machine-learning, chatbots, and machine-to-machine communication. It enables everyone, whether experienced in content architectures like DITA and XML or not, to use Microsoft Word and other familiar tools to create and share content in real time. Gartner recognized Microsoft as a leader in the Content Management Platform Magic Quadrant in 2017. Find out why! Join our special guest host, Paul Perrotta, and our special guest, Steffen Frederiksen, for this free, one-hour webinar, and learn exactly why and how Office 365 is a great platform for authoring, managing, and delivering the content of the future. Attendees will also learn the benefits that come with using it, as well as be taken through a specific use case in financial services. Since 1989, Steffen Frederiksen has been working with the creation, management, and distribution of structured, reusable business content. This work includes methods, software tools, training workshops and CMS solutions. He has managed the training of more than 200,000 writers around the globe, primarily in the financial services, pharma, and other regulated industries. While working for Information Mapping, Steffen developed the concept of “object-oriented information” as well as the MOM (Mapping Object Model) XML DTDs – some of the foundation of the DITA standard. With the objective of bringing the power of structured content to everyone, he founded DitaExchange in 2001 and developed its Dx4 software, which combines the DITA standard, Microsoft SharePoint and Microsoft Office. Title: Office 365 As A Content Services Hub? Seriously!